here are his pics from 9/11. Five years since the attacks. A lot of people have visited this site and I have received a lot of E-mails from everyone thanking me for sharing the photographs. I have just got a new scanner so I decided to scan the picture at a higher resolution from the 5x7 prints that I had. The pictures below are thumbnails. * i e-mailed him and he said that the negatives were unfortuneately destroyed, and that the pic up on his site is the best quality we can get. Has anyone here filed a FOIA request for the negative for that particular NYPD photograph? I want to write some more details and put this on the front page. Does anyone know what time the NIST photo was taken? Reprehensor on Sun, 04/01/2007 - 9:13am. The NYPD photographers have hirez digital cameras. NEVER , EVER, EVER has the original image with the EXIF data embedded within been and are still available. This one will NEVER be available and show a scoop because it doesn't exist. Hirez jpgs with the EXIF data are probably taken from the same NYPD helicopter are still out there. 911veritas has many. If you use Windoze, get Irfanview, an image viewer/editor. It will allow you to peek at the EXIF data for many jpgs/raw images taken with modern digital cameras. dicktater on Sun, 04/01/2007 - 12:13pm. They include this one (below), with conclusively prove that the burning damage seen on the south-west corner (floors 29 and 30 - west edge) happened prior to 11:33am (EXIF info provided by dicktater). 911veritas on Sun, 04/01/2007 - 12:29pm. But, it was manipulated in Photoshop by Aman Zafar on 10-25-2006 according to it's EXIF data. Zafar may not have negatives but, may have the original files from scanning the prints. dicktater on Sun, 04/01/2007 - 12:47pm. However, I don't think the NIST picture is a fake. It seems to me that a portion of the SW corner is obscured by smoke in the NIST picture and that NIST was claiming the portion of the building obscured by smoke was missing - lopped off by the falling WTC 1. The Aman Zafar picture shows it is not missing, so this is a good point against NIST. If memory serves, there was a post on here a while back saying that NIST were bigging up the damage to the south face too. Btw, I had a look at Zafar in another context (does anybody remember the "Concrete Core"?) and he seems 100% legit to me. Kevin Fenton on Sun, 04/01/2007 - 10:11am. "Study of this photograph indicates that at least two exterior columns were severed." The Zafar picture shows it ain't true. I bet they're bigging/making up the other alleged hole in the South side as well. 25% scooped out - I doubt it. Kevin Fenton on Sun, 04/01/2007 - 11:26am. ya... i first saw the picture in this paper. the paper goes into detail about another WTC 7 pic that doesn't show as much of the building, and only uses the Zafar pic as a reference point. I thought that the Zafar picture showed a lot more of WTC 7 than the picture that this winston smith guy analyses in his paper. click on it, you will get the full resolution. truth911.net on Sun, 04/01/2007 - 10:24am. i don't know anything more about the NIST pic. I just know that the NIST pic and this Zafar pic are the only pictures of WTC 7 from the 18th floor down on the SW corner that anyone knows of. a while ago, i went looking for more pictures of WTC 7 (and only found the zafar pic), but every other pic of wtc7 has that section blocked by something. I think this is a big reason why they havn't released so many ground zero pictures. probably be a lot more out there. 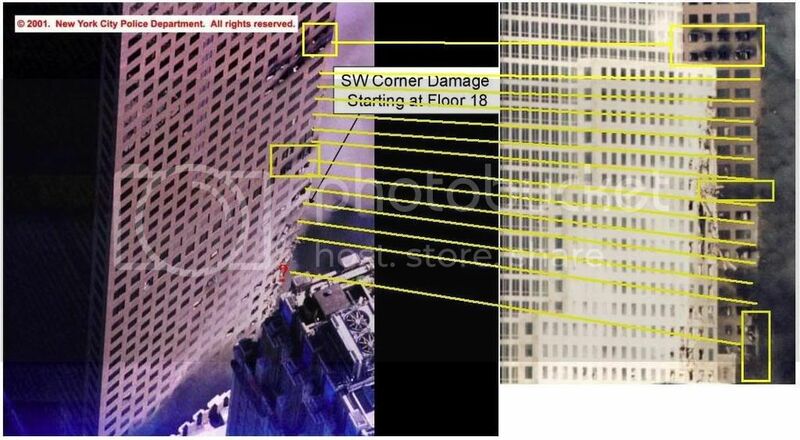 so maybe there are more pictures out there in someone's photo album that show WTC 7 without the "25% scooped out" . i don't even think the NIST looks like 25% either, more like 10%. but anyways, even if it was real, it couldn't cause a symmetrical collapse. i think in the comming weeks as WTC 7 gets all the publicity, they'll rely more and more on that photo, since it's the only possible counter arguement to explain the collapse. as far as i know... the NIST picture first surfaced in April 2005 when NIST released thier preliminary report on WTC 7. (they also show a picture of damage to the penthouse, but i don't really see what damage they're talking about). So ya, i've had lots of questions about that picture. i've always thought that it looked pretty fake, and found it strange that you can't find any other picture of the building from the 18th floor down on the SW corner. I also don't really know where the picture was taken from. From a nearby building? helicopter? i suppose it doesn't really matter. but i would like to see the set of photographs taken on that film. the thing with our pic (the zafar pic), is he's just some random guy, who put on internet a series of pictures that he took on 9/11. We have no information on what happened to the NIST pic. what other pics were taken. who took them. where it was taken from. for all these reasons, i find the zafar picture far more credable and i think that it proves that the NIST pic is fake. truth911.net on Sun, 04/01/2007 - 10:37am. The region around the alleged damage is much brighter than the rest of the image. Is this a sign of editing? Perhpas someone with photo editing experience could clear thisup. I've watched perhaps hundreds of hours of footage but found no video that shows antyhing below the 19th floor but smoke and dust. I think the fact that no such video exists is striking. If this is indeed a retouched photo, which it looks like to me, whoever did this knew that no video existed of anything below the 19th floor. Does anybody know if there's better quality version of that last pic? It's the World Financial Center. 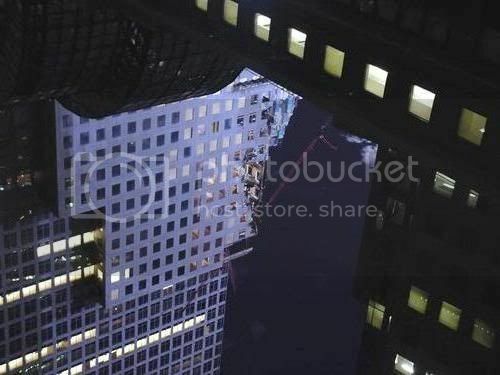 Would the blueish image of the WFC damage pasted over the purple WTC7 would explain the washed out part of the WTC7 pic? Here's a Russian page about the corner damage. Discharged quantitative comparison of the two colour photographs of fragments west angle tower WTC7 made after a fire in the tower was recorded reporters (16:10), and before the tower collapsed (17:20).The first photograph was taken by an individual and, until recently, been published, the second with a police helicopter and published in the NIST report as evidence that the south-west corner WTC7 was severely damaged from debris strikes towers WTC1 with its collapse. The channel B (blue) in zones 5 .. 10 second snapshot is not in line with the trend these values in the first. The most logical explanation is artificially changing brightness blue in these zones to improve the "reliability" of the image as a documentary evidence that the picture in the scene damage the south-western corner of WTC7 occurred at the time of caving WTC1 and was due to the impact of large debris and destructive "jet" small debris, traces of which was (primarily) deeply vjevshayasa dust-so clearly in the official photograph. Official snapshot (with a very high probability) forged. 2. Calculated average values of R, G, B pixels for each of the designated sites. arie on Sun, 04/01/2007 - 10:39am. btw man.. i love your WTC 7 video... definately the best WTC 7 video.... i wish we had little movies like this for all subjects (pentagon, wtc towers, shanksville, etc.) i'm actually gonna update it on my website right now, i have your old version in my recomended videos section (i havn't updated my webpages in ages!) ... . i put it on a new DVD compilation i'm making. are you going to make any updates to the video? maybe with clips of rosie, the inside edition clip, and then this analysis of the NIST photo? truth911.net on Sun, 04/01/2007 - 11:11am. did they put this photo out the next day? cuase they sure didn't put much time into this forgery. the damaged portion of the faked photo isn't even showing signs of fire. ????????????? why do we have such a hard time convincing people? JJJames on Sun, 04/01/2007 - 11:52am. Another thing is that the cladding still seems to be attached to the damaged corner. arie on Sun, 04/01/2007 - 12:14pm. If the NIST photo is fake I'd have to ask why they bothered to fake it. After all it doesn't show enough damage to explain a straight down collapse. I think this is a red herring issue. misterguy on Sun, 04/01/2007 - 12:50pm. It's the only photo of any damage to WTC7 at all. I believe it's there to make the '25% scoop' more believable. There's no photo of the supposed large hole in the NIST report. I believe the corner photo is indeed retouched with the purpose of making the huge damage claims more credible. I think it's very suspicious that apart from this pic and the pic from Aman Zafar there are absolutely no known images from the corner below the 19th floor. This would give the perps the oppurtunity to use this region to fake some extra damage to WTC7, making the 'collapse by fire and damage" more credible. They must have overlooked Zafar's photo. arie on Sun, 04/01/2007 - 12:58pm. they couldn't have faked any more damage because it would be contradicted by too many other pictures and videos. When they faked that pic, they thought that there were no pictures of the SW corner from the 18th floor down. (now we've found 1 !) Had they made it look like there was more strutrual damage, other pictures and videos would have proved the photo fake. truth911.net on Sun, 04/01/2007 - 1:22pm. ...probably came from the fact that the photo was taken from an NYPD helicopter, and making the subject of the edit WTC 7 created an image from an angle impossible for anyone else to duplicate. Perhaps they waited a while until the web was scoured for other images that could refute this one? Many of the people who had pictures were scrambling to make them available and to perhaps make a buck. No problem. Their right to do so. NIST et al probably felt that the bulk of images were already out there and that the probability was favorable that an image that could disprove the veracity of the severely manipulated image didn't exist. So, they went ahead and leaned heavily on this one. When was the earliest appearance of this bogus image? June 2004 is the earliest I have found so far. When did Zafar's images first appear in the public realm? Using archive.org, the first WTC page for Zafar available there was 2002-01-27, though the URL indicates that the "snapshot" was taken 2002-01-07. Zafar's three WTC 7 images of interest do not appear in the index of thumbnails on any of the the pages captured by archive.org through April 22, 2006. The images currently on Zafar's site indicate the last change of the files, which may be when they were uploaded there, is 2006-09-10. This may have been the actual date of a hosting change for Zafar's site, now hosted by Network Solutions in Herndon, VA, from amanzafar.no-ip.com to amanzafar.com. I assume that Zafar was originally hosting his site on his own computer because the use of no-ip.org is for sites with dynamic IP addresses. So, it is possible that when Zafar's site was moved to Network Solutions for hosting, the actual images were changed then to the current ones of higher resolution. This includes images available in 2002 and now. Bottom line is that it appears that Zafar's three WTC 7 images of interest were not available on the web until 2006-09-10. Here's some WTC 7 southwest corner and south face video I just found when looking over the WTC 7 collections at Pilots for Truth. I see that Arie has been working there, too. dicktater on Mon, 04/02/2007 - 12:39am. Slipgrid on Mon, 04/02/2007 - 8:43am. Download PDF from NIST FOIA of NYPD photos apparently from the same set as the fake looking one. I've found out all I could about these photos and all other helicopters on 9/11. Aug. 2014 - "Case of the Missing NYPD Helicopter Photos," by myself, the developer of 911conspiracy.tv -- links to many more photos. 911conspiracyTV on Fri, 09/05/2014 - 12:49am.